The Windmills, Water Mills and Woolen Mills (Felinau) on the Isle of Anglesey (Ynys Môn) in North Wales. Anglesey, Llanddeusant, Llynon Windmill - the only working windmill in Wales. In February 2015 I was asked by a lady named Judy Gordon if she could paint the above image, as she is learning to paint. Imagine my surprise when just two days later she sent me this image of her painting. I know you will agree that it is superb. Judy Gordon's painting of Llynon Windmill. When these pages are complete, I can assure you they will be the most complete and correct record - to the best of my abilities - with the highest resolution images available anywhere on the internet. I have carried out my own research, and hope to record Anglesey's windmills, water mills, tide mills, fulling mills and any other type of mills. I would be indebted to anyone that is able to supply me with high resolution scans or indeed the original old photographs of any Windmills, Water Mills and Woolen Mills of Anglesey. Please email them to me or let me know where they may be viewed here. The history of the Watermills and the Windmills on Anglesey will probably have began during the occupation by the Romans, who were known to have used them. Amongst the earliest of written records that mention Mills on Anglesey is King Edward III's Extent of 1352, which mentions over 60 Mills. Other important records are the Inventory of Ancient Monuments in Anglesey, printed in 1937, and mentioning over 30 Mills. In 1958, R.O. Roberts of the Anglesey Antiquarian Society wrote an informative guide to the history of many of the Mills, and copies may be viewed in Anglesey's Libraries - at least they may in Holyhead Library where I did much of my research. In 1992, Barry Guise and George Lees published a book titled 'Windmills of Anglesey', which I can recommend as an extremely interesting read, and I have to thank them for much of the information that is published on these pages. In the 18th century, William Buckley kept diaries which have been a great source of information, and also give a good insight into Anglesey life during that time. It is from those diaries that we know when many of the Mills were actually built, as of the Windmills still to be seen today, none were built before 1737, and the latest was built in 1862. 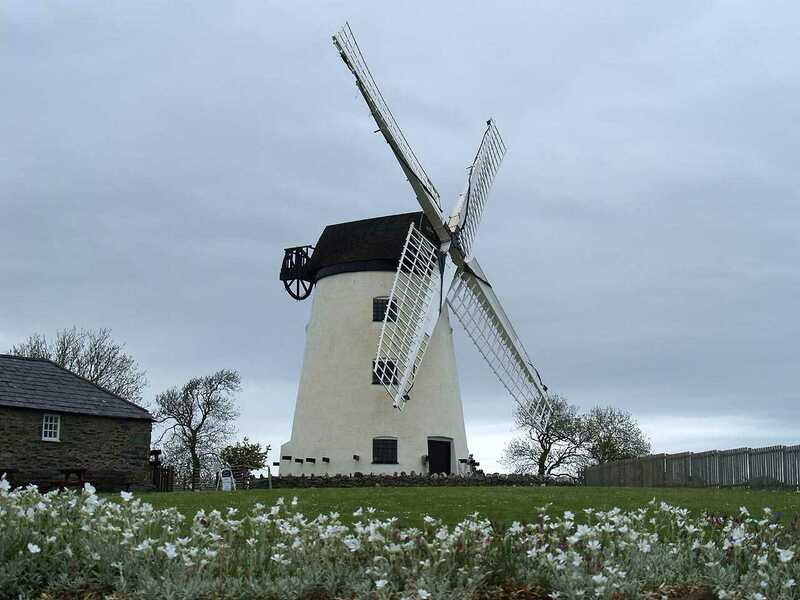 In the early 1800's Anglesey could boast approximately one hundred mills, of which about one half were Windmills. Anglesey was so fertile - and known for being so - that the boast was that the island was fertile enough to feed the whole of Wales. Hence the saying in Welsh - Môn Mam Cymru - the Mother of Wales. Anglesey was also referred to as the 'Granary of Wales'. Sadly, many of Anglesey's Mills have now been lost to the ravages of time and the elements, or have been demolished to make way for house building, but neverthelesss there are many ruins still to be seen, and an ever increasing amount that have been tastefully (in my opinion) converted to dwellings, whilst maintaining their identities as Windmills and Watermills, which is possibly as a result of the vast majority of them (but not all) being listed buildings. Felin is a mutation of the welsh word Melin meaning Mill, Môn is the welsh name for Anglesey. Ynys Môn is the Isle of Anglesey. Melin Gwynt is Windmill, Melin Dwr is Water Mill. Of course water mills would be useless without the water that powers the wheel, and we are fortunate to have quite a few rivers here on Anglesey. Now before you perfectionists reach for your email programs, what constitutes a river is quite interpretational - in fact a river is just a large stream. When you look up the meaning of river, there are many versions of what is supposed to be the criteria for qualifying as a river. Suffice to say, I best liked the version that reckoned that you had to swim across a river, but you could walk across a stream. End of. Afon Alaw, Afon Braint, Afon Bran, Afon Cadnant, Afon Cafnan, Afon Caradog, Afon Cefni, Afon Ceint, Afon Crigyll, Afon Ffraw, Afon Goch, Afon Lleiniog, Afon Lligwy, Afon Marchogion, Afon Meddanen, Afon Nodwydd, Afon Wygr. If you believe you can add to that list please let me know. Update - February 2010. - it is becoming apparent that there are on Anglesey the remains of many more mills - in particular water mills - than one might originally have believed!